Hopefully by now you've read our post on how to leave everything behind, hop on a plane and go have the experience of your life (If you haven't, it might be a good place to start!). Now- congratulations! You've booked your tickets and now you have to do a myriad of things, one of which, of course is deciding what to bring and how to bring it. Our advice? Leave as much behind as possible. You'll be surprised at how little you will actually need once you're on the road. Traveling with less is the way to go. It will make your life so much easier and you'll thank yourself later for not packing your blankie or your favorite pillow. 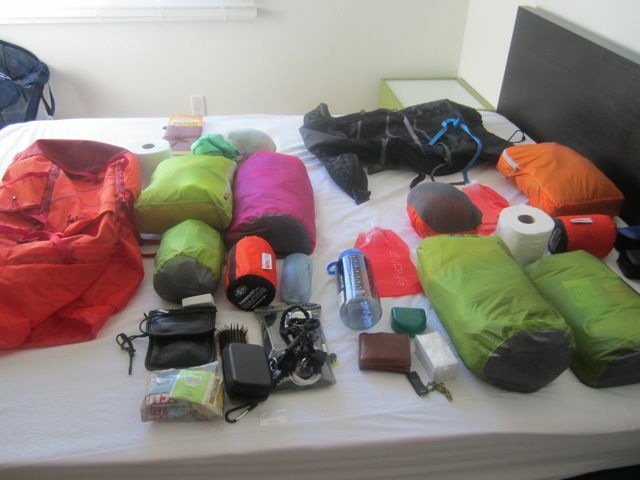 We spent a significant amount of time doing research in order to find the most ultralight, minimalist solutions to our packing needs. On top of that, we wanted to make sure that everything we brought with us was practical and had a use -- for example, we did not pack any cotton t-shirts. The following is a list of the essential and practical ultralight items that will make your globe trot a breeze. The stuff in brackets are things we should have packed and the strikethroughs are things we wish we hadn't packed. We are also including recommendations and some links to where in the U.S. you can find most of this stuff. *Disclaimer: we've added some useful links for Amazon so you can just click and check out some of the essentials if you'd like. We get a few cents if you click the links below -- our intention is not to make money but to try to make your life easier. We spent a long time researching these things, 90% of it is the exact style/brand we use! Clothing (per person) -- most items are on the expensive side but oh so worth it! 3 short sleeve quick dry shirts. Why quick dry? Keeps you cool or warm and is very easy to hand wash. Patagonia has great options ($30-$50); here are slightly cheaper but still great ones for men and women. 2 long sleeve quick dry and/or merino wool shirts. REI, Patagonia and Costco may carry them depending on season/location; otherwise try this for women and this for men . 2 pairs of quick dry convertible pants. REI and North Face . 4 pairs of quick dry active underwear. Patagonia has pretty good stuff. 4 pairs of merino wool socks (if you're planning on hiking a lot, which we did). Smartwool and REI socks worked great-- if you suffer from blisters, consider buying additional liner socks . One nice fleece. Patagonia's R1 is AWESOME. One windbreaker and rain jacket. Again Patagonia's super cell rocks for this. One wool hat for the cold. Windproof gloves . Eliot bought woolen ones in Nepal and they weren't as useful. One pair of board shorts . One bathing suit (Eliot's board shorts double as a bathing suit). Sunglasses -- the Peppers ones have worked really well so far. In addition to their more traditional applications, these are great to hide behind on crowded public buses. 2 laptop computers . We preferred this over an iPad since we knew we'd be writing quite a bit and I have to say, having a laptop has been great! 2 universal adaptors, make sure you get just the adaptor, converters aren't really necessary plus they weigh a lot: this one is really cheap and ultra light. One camera and its battery charger. We just have a cheap-o Canon point/shoot one , the risk of having something nicer stolen (happened 3 times to Drea in Philippines, Spain and Colombia) scared us away from something nicer like an SLR. 2 Kindles . Paperwhite is really nice and the batteries last for weeks! This is significantly--no-- ridiculously better to packing bulky, heavy books. We have a library of over 11,000 books that weighs nothing. Get it at Amazon. A waterproof case for each kindle. You can read while you float! One iPod and a splitter so we can both listen to music at the same time. Amazon has pretty cheap ones . A 32 GB memory card for the camera- one will do, 32 gigs is a ridiculous amount of space. 2 ultralight Petzl LED headlamps. 1 Freedom SteriPEN . This thing is awesome! You don't have to buy bottled water (contribute less to waste) and it purifies water right in your Nalgene in just under 2 minutes!! Jailbroken, SIM-card-enabled, smart phone. This way you can buy a local SIM for calling/data in every country, it's a cheap lifesaver. A pair of flip flops (Reefs for her, Rainbows for him). A solid pair of high-top hiking boots. For multi-day hikes, high-top boots are a must! Our ankles would've both been broken by now if we had opted for lighter shoes. Try Zimberlains or Solomons. These suckers have about 600 miles on them as of writing! Waterproof stuff sacks are key! Shaving oil . It's tiny and it works! It's like 4 ounces of goodness and lasts for ever. 4 razor blades and a razor. 2 deodorants. Boys stink more than girls. [Condoms]. The legit ones are very expensive abroad ($2/condom!). These are necessary when taking anti-malaria pills which can reduce the effectiveness of BCPs. Simply using soap for shaving works great. 3 razor blades and a razor. Birth control pills (BCPs) - make sure you get a long-term prescription from your doctor that can be filled in full at once! Tampons and a moon cup. Tampons are extremely hard to find abroad, everyone seems to prefer pads. Hair brush and ample hair ties (8) and sporty head bands (4). Contact lens solution and contact cases. Bring a small bottle from the U.S. and then buy a big bottle of solution once you reach your first destination. Drea's the blind one in the relationship. One small and one large pair of nail clippers. 2 Sportsmen sticks of 30% DEET repellent . The liquid stuff spills way too easy and will ruin everything. 3 sticks of 50 SPF sport sunscreen . Whatever toiletries you can get in a solid form, do it! It's easier for carry-ons. One travel-size 40 and one 50 SPF sunscreen cream. Again, good for the pale ones! Razor Gator. This silly little thing actually lengthens the life of a razor blade by months! Two compact travel towels from Sea to Summit. Two steripods (great little pods for your toothbrush!). Drea lost hers on a plane and misses it terribly. Super concentrated shampoo and body wash. You can easily buy this stuff locally, no need to bring it along. Sea to summit soap strips . These are little strips of soap that have come in very handy. [Hand sanitizer!] We stupidly did not pack any and it wasn't easy to find. Face wash. If you finish it you can easily buy more locally. Floss, keep away those cavities! Also works great to sew things back together- it's sturdier than thread! Travel Clothesline . We love this and have used it extensively! One Nalgene wide mouth so you can SteriPEN your water and then transfer it to your Platypus. 2 Platypus water containers . 2 sets of personalized cards. Moo cards and Vistaprint worked wonderfully for us both. One travel First Aid kit plus extra moleskin for blisters. They took away our medical scissors at Kathmandu airport :(. 6-months worth of contact lenses. 147 days (or however long you'll travel) worth of doxycycline (anti-malarial) for each of us. Cipro antibiotic for emergencies (nuclear bomb for anything bacterial). Hard shell camera case with a small carabiner. 3 pens and one sharpie. This is a must! [A box of cheap pens.] We really meant to bring this and totally forgot. A lot of local village kids really want pens/pencils for school. It's a great substitute to cash. [Toilet paper and tissues.] It's bulky for sure but the quality of TP and tissues from home is just so damn superior and cheaper than anything we've found abroad. It's especially nice to have when you're out in the wilderness... We bought it all locally but it was often super overpriced and, let's just say, rough around the edges. 40-Liter Boreas Buttermilks. These backpacks are awesome and come with a rain cover. Very simple and so easy to use. PLUS very hard to pickpocket as there is only one point of entry. We love 'em! 3 ultralight waterproof sacks from Sea to Summit and one non-waterproof packing cube each (different sizes to match your needs). Although the ultralight model is very light, it's not as sturdy as the light ones and some of our sunscreens poked holes through. These are great for packing: we use one for electronics, a small one for toiletries and another for other stuff. We use the non-waterproof packing cube for clothes and that's it! It makes packing SO easy. Sea to Summit's key chain bag . This backpack has been crucial and is super light and fits in a lot of stuff including both of our laptops and fleeces all at once. Believe it or not, all this stuff weighs less than 60 pounds combined!! 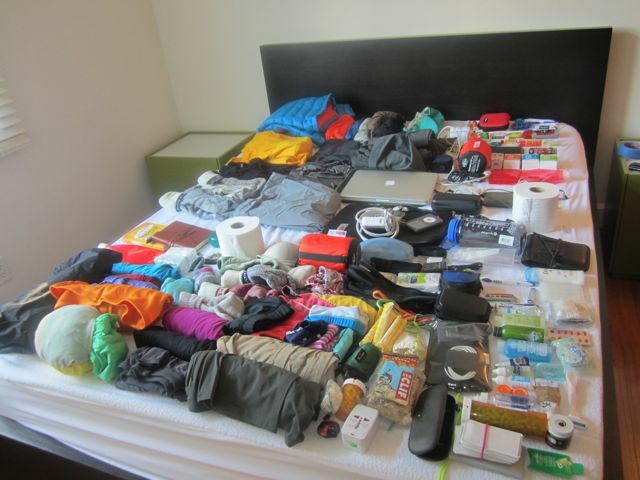 And it all fits in a small, 40-liter backpack. 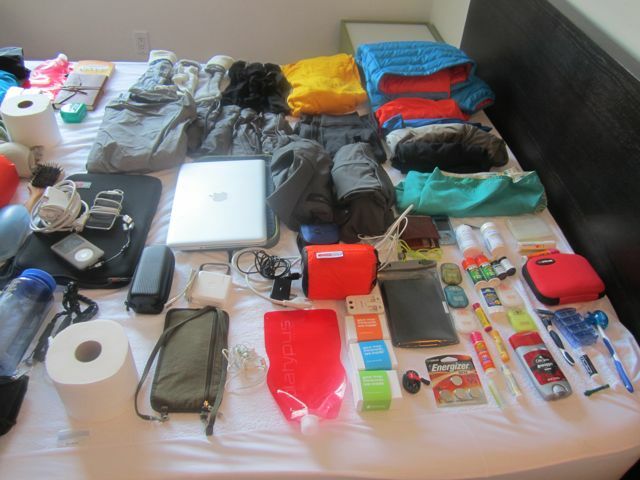 Thinking about it now, there are only a few things we haven't used at all so the list above should help you get all set for your big trip. Have fun packing! Drea - this is SUPER helpful and thorough!! I would expect nothing less from you :) Another good tip I've used is rather than hair conditioner, just stick with regular shampoo (and dry shampoo is another great, light carry-on trick) and bring a hair oil like Moroccan oil. It's much smaller and more concentrated for space-efficient packing. Also, how did Eliot fare with Doxy in the sun?I've found that while Malarone is pricier than Doxy, for us pale people it is better than a whole trip of sun sensitivity, which is a super-painful Doxy side effect. So glad you found this helpful! We found it a bit overwhelming in the beginning to pack so light for "such a long time" so we wanted to make it easier for our friends/fans. I've heard about this dry shampoo product, what exactly is it? I'm running out of conditioner at this precise moment so I'll try to find some oil if I can (we're in Sumatra at the moment). Eliot ended up getting some pretty bad burns but it was actually prior to taking the Doxy. Although we noticed that our skin was more sensitive to the sun, good ol' 50 SPF kept most of the nasty sunburns away. The key is reapply, reapply, reapply. Let me know if you have any other packing tips/suggestions! You could hold all of that comfortably on your back? I don't know, that's a pretty minimalist list but believe it or not, I would still cut a few items from there. I like to go as light as possible. You mentioned several things most of us wouldn't think about until after we enter a new country. Thank you. Hello Travel coupons -- yes, believe it or not it was all very comfortable to carry it all, I think the packing cubes/sea to summit bags make a huge difference. And I do agree with you, it's easy to cut out a few things from the list. There's toilet paper in the pictures, for example, but we did not pack it. Now that phones have a lot more memory, I'd probably drop the iPod too and I'd ditch the soap strips I mentioned. Depending on where you go and if the weather is more consistent, you could definitely shed even more. Wow! That's nice big check list. I love your attention to details. You have chosen bag which pickpockets would find it difficult to get into. Who thinks up to that level. Now you have earned a fan for this blog. Thanks Wanderer! We spent a lot of time thinking about the list and I'm happy to hear you have found it useful. Boreas makes great backpacks and we never had pickpocket issues. Same Day Taj Mahal Tour By Train is best tour package to travel in agra city in one day, Thanks for sharing your travel experience with us. 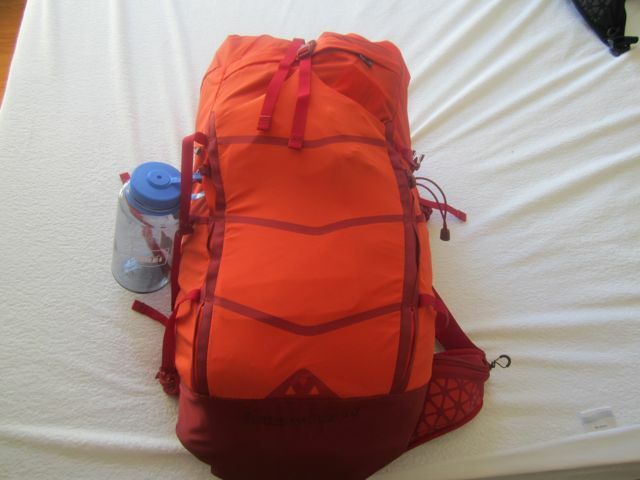 Thanks for sharing this information about this backpack These all things really very interesting and informative also. 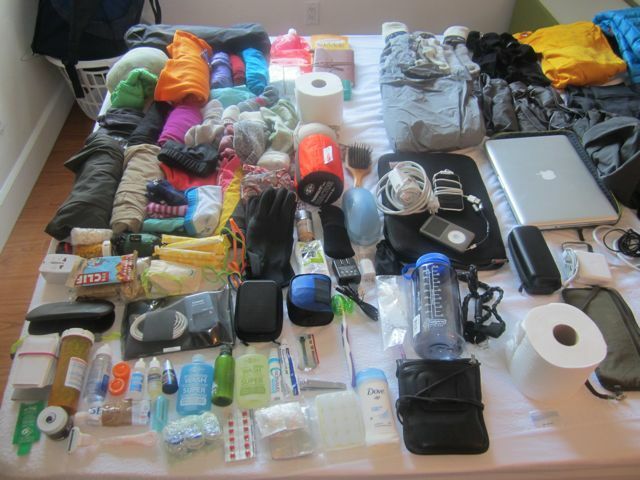 Loved this post..
"What the #^@% are you going to do in Ethiopia?"